Many hotels have given their delivery robots names. The Renaissance Las Vegas Hotel calls its two delivery robots Elvis and Priscilla after the "King of Rock and Roll" Elvis Presley and his former wife. Room service has taken on a new twist at several hotels around the globe. When a guest calls for extra towels or food, the one making the delivery to the room may be a robot. ​"The teenagers and the younger kids, they love the names. They love running around talking to their parents about, 'I’m going to call Elvis and Priscilla to the room,'" said Karl Kruger, General Manager of the Renaissance Las Vegas Hotel. Elvis and Priscilla were created by the Silicon Valley-based company Savioke. 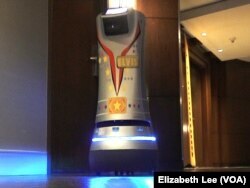 The company calls them Relay robots, although hotels prefer to give them names that are more fun and personal. Kruger says the robots do not replace human employees, but assist them in their work. Elvis and Priscilla most commonly deliver toiletries or food and beverage in the evenings and overnight when the staff is minimal said Kruger. Many hotels around the world are embracing technology at a time when the Internet is providing what seems like endless options for travelers. "Our business is very competitive, whether it’s Airbnb or it’s another brand, and so you have to stay one step ahead of the competition," Kruger said. Relay robots also are finding work in delivering other types of necessities. A FedEx repair facility in New York has a Relay robot named Sam. It can deliver broken cells phones to technicians to get them repaired. Savioke also plans to roll out robots soon for use in a medical setting. 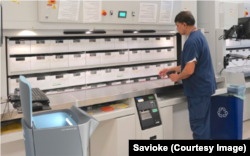 "We’re going into a number of hospitals this year where we’re bringing either pharmaceuticals or lab equipment or lab samples — specimens from one place to another, so there’s a lot of stuff that moves around in hospitals," said Steve Cousins, Savioke's founder and chief executive officer. A Relay robot has a map of its environment and uses a laser and a 3D camera sensor to help it navigate. Users such as hotels or hospitals can choose the option of seeing through the robot's eyes from a mobile device. Cousins emphasizes that the placement of the camera looks down at the floor, and the feature is not to monitor people, but to make sure the robot doesn't run into problems. Savioke, a San Jose, CA based (Silicon Valley) company shares a stock photo of a Relay robot in a medical setting. It can deliver specimens, lab equipment, pharmaceuticals, etc. in a hospital setting. "Typically hotels like that feature that they can see what their robot sees. They’re focused on seeing what’s in front of the robot and what might be blocking it," said Cousins. Relay robots can talk to the elevator to get to the right floor, and the robots are expected to get even smarter, with new features coming soon. "It’s got the ability to detect whether the wifi is out in some part of the building, and that’s something we’re rolling out this year — to look for the dirty trays in the hallway and those sorts of things for hotels, and then there’s going to be analogous things for hospitals — maybe it can detect equipment and keep track of where things are," said Cousins. For world travelers, Savioke’s robot already has found work at hotels around the world, from North America and Europe, to the Middle East and Asia. A Relay robot can be hired. The monthly rental fee for this "employee" that can work 24 hours a day without lunch breaks will cost about $2,000.